"When I look at my beautiful kitchen, I feel so appreciative to all of your skilled team. 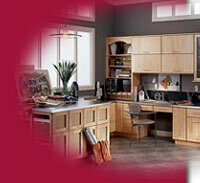 Your craftsmen have created a beautiful, clean, and effective kitchen for us to enjoy." "We recently had our kitchen remodeled. The service provided was from Tool Time, a highly competent and efficient organization. They went about their work in a businesslike manner. They arrived at the scheduled time promptly. When completed for the day, they had removed all the trash and not only cleaned up, but vacuumed. When our cabinets arrived for mounting, again, it was a prompt appearance and the same caliber of workmanship. We now have our beautiful new kitchen and are proudly showing it off."